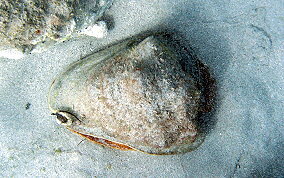 The large Emperor/Queen Helmet snails frequent the shallow sea grass bays and areas of dead coral and coral rubble. 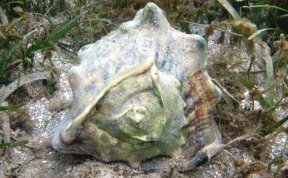 They have rainbow colored shells when not covered with algae and other organisms. 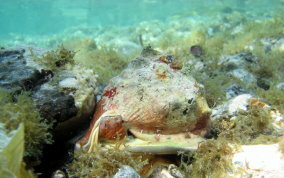 Sometimes you will see just the tops of the shells because they bury themselves in the sea bed. The growth pattern on the rear end of the shell is different for every snail making them easy to identify. The King Helmet's shell's outer lip has 3 dark brown triangular bars, the Emperor/Queen Helmet's shell does not. In about 2 feet of water. King Helmet Snail Taken underwater - an animal w/ 8 inch shell. The smaller King Helmet-shell only about 4 inches.